Your wonderful LFA group is up and running and doing a great job. 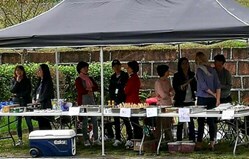 Yesterday they had an awesome bake sale that was a huge hit with the LIS students and the visiting teams and coaches. They will be up and running again tomorrow at the CISA U15 and U11 Soccer tournaments at LIS. If you would like to lend a hand please email Maggie 淑烜 鄧 at fraukeu@yahoo.com.tw. Please see the section and picture for all trips… thanks to all the great teacher/ chaperones for offering such a great experience to all the students. The grade 4 & 5 field day will be on Friday 20 October. Students will leave LIS at 08:30 and will be back by lunch time. It looks like a great morning of activities. Please make sure your child has a water bottle, and appropriate clothing for the weather. There will be fruit and water available at the venue. If your child would like other snacks please send them with them. Our CISA U19 Boys and Girls Volleyball teams had a great day yesterday! The girl’s team, coached by Mr. Scofield and Mr. McCarthy, improved so much that they were winning sets away from the championship team. While the boys, coached by Ms. Carol and Ms. Chloe, actually divided and put in two teams to represent LIS. Both teams did very well and the boys finished 2nd and 4th. Tomorrow will be a great day at LIS. We will be hosting 15 teams, 6 U11, 6 U15 boys and 3 U15 girls’ teams. Games will start at 09:30 and will be finished by 4:30. Players will need to be at school no later than 09:00. Bus times will be out today. 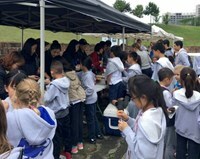 LIS players will receive a ticket for their LFA lunches. If they would like to purchase some goodies other than that they should bring a bit of cash. CISA will provide fruit for all players. We would love to see you out cheering on the teams. Please make sure that your child has all his/her gear before they leave home… including shin guards and soccer socks. Please remember that clubs finish next Thursday. The next week, 23rd onward, Children from SK – grade 12 will be taking the 3:30 buses home on Tuesdays and Thursdays until the next club season which starts on 14 November. Ms. Felicia’s PE swim classes continue for one more week... Please make sure your children have the appropriate gear prior to this. We know that the clothing store has run out of a few items. We are reordering now. DUE TO THE CISA SOCCER TOURNAMENST THIS WEEKEND THERE IS NO ADI SPORTS. ADI SPORTS WILL RESUME ON 21 October.